From June 14 to 22, 2018 the staff of the CAPAZ Institute visited the Justus Liebig University Giessen (JLU) and the headquarters of the German Academic Exchange Service (DAAD) in Germany. During the stay at the JLU, the academic director, Prof. Dr. Stefan Peters; the administrative director, Dr. Carlos Nupia, the administrative and financial coordinator, Mrs. Carolina Cerón, and the Public Relations’ assistant, Claudia Maya M.A., attended two important academic events: The International Conference on Peacebuilding in Colombia and the inaugural lecture of CAPAZ’ academic director Prof. Dr. Stefan Peters, Chair in Peace Studies at the JLU. The President of JLU, Prof. Dr. Joybrato Mukherjee, welcomed the CAPAZ staff on the occasion of the university’s International Networking Week. The Networking Week aimed at bringing together representatives and researchers from institutions around the world that carry out academic cooperation and research with JLU. Colombia is a priority country in Latin America within the JLU’s internationalization strategy. The cooperation started in the 1960s through individual contacts and subsequently has led to a long-standing inter-institutional cooperation. Jointly with the CAPAZ Institute, JLU continues the academic and institutional cooperation with Colombia in the field of humanities. In the words of Julia Volz, director of the International Office at JLU: “After a collaboration that started in wartime, we now want to contribute to the peace process in Colombia”. On June 19 and 20, 2018, the International Conference “The construction of peace in Colombia” was held at JLU. The conference was organized by the CAPAZ Institute and the Chair of Peace Studies at JLU in collaboration with the Giessen Graduate Centre for Social Sciences, Business, Economics and Law (GGS), the Faculty of Law and the Faculty of Social Sciences at JLU. Prof. Dr. Stefan Peters, academic director of CAPAZ, highlighted the interdisciplinary and intercultural nature of the conference. The panels presented different research approaches such as transitional justice, participation of ethnic groups and civil society in the implementation of the peace agreement, sexual and gender-based violence in the context of conflict, culture of memory, and the establishment of mechanisms to clarify the truth in the Colombian conflict. Presentations also discussed critical aspects and challenges of the socio-environmental and economic dimension of the peacebuilding in the territories, the reintegration / reincorporation of ex-combatants and the political-institutional order in the Colombian territories. 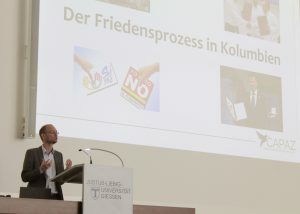 The international conference was open to the public and was attended by researchers from several German universities (Rostock, Münster, Regensburg, Erfurt, Marburg, Frankfurt, Giessen, Köln, Bonn, and Düsseldorf among others) and Colombian universities (Universidad Nacional, Universidad de Antioquia, and Universidad de los Andes). 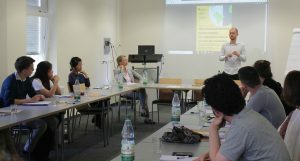 After the conference, June 20, 2018, Prof. Dr. Stefan Peters gave the lecture: “Peace Process in Colombia: Balance and Perspectives”. This lecture was organized in the framework of the Chair of Peace Studies recently created at JLU. Peters introduced the current political situation in Colombia after the presidential elections in May and June 2018 that voted for the new president of Colombia, Iván Duque (Centro Democrático Party). According to Peters the peace process in Colombia has to face a triple challenge after the election: the achievement of a lasting and stable peace, social justice, and political participation. Peters outlined the vision and tasks of institutions such as CAPAZ in the coming years. Based on the issues of research, teaching and knowledge transfer, CAPAZ will contribute to draw lessons on the past and to build a sustainable peace. Press release of JLU about the CAPAZ activities in Giessen. 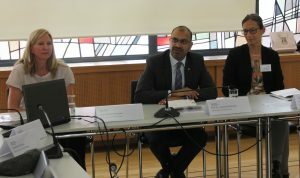 The visit of CAPAZ to Germany ended with an information day at the DAAD headquarters in Bonn. 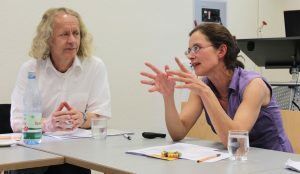 Staff members held meetings with directors and coordinators of the DAAD whose work are relevant for CAPAZ. The meetings helped to present CAPAZ to the DAAD as it will contribute to the visibility of recent and future activities of the Institute. The academic director of CAPAZ, Prof. Dr. Stefan Peters, emphasized the significance of associating CAPAZ with institutions outside Bogotá. One of the main goals of CAPAZ is cooperate at institutional level, develop research with regional impact and encourage academic production and knowledge transfer with partners in the Colombian territories. Peters also announced the future publication of a working papers and policy briefs series, the organization of new academic schools, and the academic and cultural agenda of CAPAZ.